FX moves toward sophisticated trade-cost measurement tools, alternative benchmarking methodologies, and changing business models. Boston, December 17, 2014 – Driven by market innovations and growing retail participation, foreign exchange has hit the mainstream and as an asset class looks as promising as ever, with potential for new market growth coming from a growing diversity of market participants, continued adoption of electronic trading, and increased focus on transparency and disclosure that may usher in an agency model of business. But do periods of low volume, increasing market fragmentation, and increasing regulatory supervision threaten the growth of FX? Or do these indeed signal positive changes for this market? 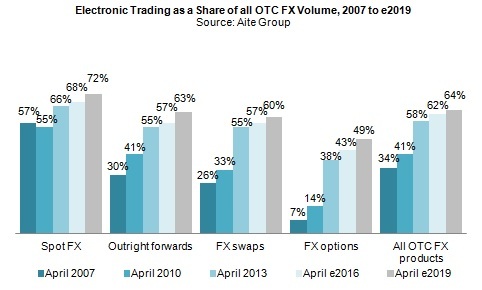 This Impact Report, based on qualitative Aite Group interviews with leading banks, FX brokers, client segments, vendors, and execution venues, examines the key market statistics and trends that have shaped the global FX market in 2014 and highlights a few of the significantly changing market dynamics. This 59-page Impact Report contains 45 figures and four tables. Clients of Aite Group's Institutional Securities & Investments or Wealth Management services can download this report.